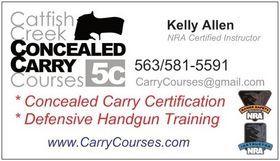 Read Kelly's article dispelling the common myth that simply having a gun is the crux of personal defense. America has been a gun culture from its inception, and today we are experiencing a revival of citizens interested in exercising their right to be armed. While a large portion of society feels perfectly safe without defensive weapons, trusting that local law enforcement is capable of protecting the masses, a great many well-informed citizens, including not a few police officers, are quick to point out that, “When seconds count, cops are only minutes away!” Many within this latter group will choose to add a bit of “insurance” to their safety by gaining a concealed carry permit. Among these, some will develop a false sense of security by adopting the notion that if they simply have a gun when they need one, all will be well. Being personally immersed in this gun culture, a frequent carrier of various firearms, and an instructor in handgun safety, I have made myself a student of pistol defense and have come to take a different view. My own observations lead me to stress that the gun I have must be appropriate for the situation if I hope to defend myself effectively. Thus, I seek to lead students and new shooters to appreciate several important decisions they should make early-on. Nearly every week I meet new shooters as they arrive for concealed carry instruction and in the several pistol competition leagues I attend. In these venues I get to visit with people and to watch them practice their shooting skills. While I find that these good folks are generally quite safe in the way they handle firearms, I also worry that a percentage of them might need a bit of luck if they ever found themselves in the midst of a gun fight. I don’t mean, in any way, that they would be better off without a gun; but they should be as serious about their firearm purchase, and their personal practice drills, as they would be in buying and maintaining a home or automobile. The choice to arm one’s self is more than just an important Constitutional right, it is a vast responsibility, and should not be taken lightly. Thus I’m delighted when students and shooters ask my opinion on subjects related to concealed carry, and defense in general. Such people are often surprised when I tend to ask more questions than I answer. We all start somewhere as we launch into any new endeavor, and this subject is no different. When I first began carrying a gun, many years ago, I learned the hard way that there is no such thing as “the perfect holster.” My first gun proved to be difficult to conceal at times. It wasn’t long before I added another pistol to my wardrobe, lighter, and smaller than the first, and soon had a small collection of holsters. I was encountering the same process we all experience with any new interest: I was learning what works for me, and what doesn’t; what I like, and what I don’t like. Until we gain the knowledge and experience to make informed decisions on a subject, we will be prone to pendulum back and forth between extremes until we finally find our satisfaction. In a subject like self-defense I like to see people advance in their reasoning and abilities as quickly as possible, given the life and death importance of the topic. So I propose here, to share a few observations I’ve made over the years. I will avoid making endorsements, as much as possible, but will highlight a few of the questions I wish I had asked before my hair turned white. Armed with this advice, readers may reach a comfortable place in their decisions sooner than I did. The first question I like to ask people is, “Why do you want a gun?” Their answer, if honestly considered, will go a long way in helping them select the right gun for their needs. Here I encourage people to take an assessment of their “safety risks”. They should list the places they go, the types of people they deal with day to day, and the sort of situations they may encounter if something unexpected happens. If their risk is low, then perhaps their defensive solutions can be minimal. If their risks are high, given the wrong circumstance, then they may want to get very serious about defensive options. Understanding our risks doesn’t make us ready to snag a gun yet though. If a girl evaluates her risks and is swayed toward buying some sort of large caliber hand cannon, while her usual attire is a tube top and mini skirt then something needs to change. Therefore, I encourage people to ask next, “What do I wear?” If they hope to hide a gun under their clothes, then they will need to dress around the gun they choose – and choose a gun they can dress around. It becomes reciprocal: a change in one factor, will affect the other. It may be helpful to first narrow the field of choices. Rather than throw-out all those skin-tight T-shirts and buy a parka, consider whether that hand cannon is really necessary. A brief review of pistol types, in the context of a risk assessment, could save a few grey hairs, and a good deal of money. Most people will find themselves in a low-risk situation. The dreaded march for gasoline, after ignoring the gauge for too long, might be their biggest risk. When walking mid-day, or during rush hour, through a medium crime neighborhood the biggest threat is probably being struck by a passing motorist, but it still wouldn’t hurt to have a gun. A medium caliber revolver would be a good choice. These are easy to conceal in a pocket or purse, yet threatening and effective if you need to draw one. With a small amount of practice, a revolver can become an effective tool at short range. If travels take someone through that same neighborhood later at night, when crime is higher, the revolver may still suffice: but one’s abilities may need to improve. A bit more practice, and tactical insight, might help turn-away even a small group of thugs. The addition of a laser sight to the sidearm gives an edge at night, and can be quite intimidating to would-be robbers. These are the types of considerations to weigh, and questions which arise through the process will help steer personal study within the vast array of defensive subjects. If the risks are higher, let’s say an armed mugger in close quarters, our tactics and personal practice come to the forefront. Use of any firearm within mugging distance, often closer than arm’s length, can be as dangerous to the defender as to the attacker if presentation of the gun is not properly executed. In such a situation the best solution may be to strike with an offensive physical move, rather than drawing a gun, and techniques abound for effective methods to stop a motivated threat. There are simple ways to disarm a knife-wielding mugger, or to take his gun and use it against him. As an example, a powerful jab to a mugger's nose with the heel of the hand will cause his eyes to water, and his surprise at this unexpected pain may provide a moment of escape without further altercation. As we can see in the example of this situation, a gun should be only one part of a defensive strategy. The most powerful tool a defender will possess is the ability to assess a situation, and respond with an appropriate solution to end the danger. If it is determined that the gun needs to be the solution then a wide variety of firearms would do the job, and each gun will have advantages and disadvantages. In general, any gun which can be operated with one hand, while the other hand might block an incoming blow, or hold your attacker at bay, is a good choice. Even a pistol small enough to keep in a pocket could still be effectively used at this close range. Less than lethal tools should be considered as well, perhaps a Kubaton, or pepper spray. There are, of course, risk situations which cannot be predicted, and these must also be considered. The recent example of a flash mob, hundreds of young people flooding a mall in Kentucky, is worth studying. In such a situation defensive practice and handgun choice would likely be mute. The best solution is tactical knowledge. No one can stand a lone defense against a horde of charging bodies, but knowing the proper way to flee such an event could save a good deal of trauma. Having the insight to gather my family and flee to the storeroom of a retailer whose wares are less attractive to looters could remove my loved ones from harm’s way quickly. Knowing that most storerooms will exit to an exterior receiving area could put them safely into the arms of law enforcement. In fact, tactical insight in this situation is absolutely crucial. What appears to be life-threatening may ultimately be little more than an angry protest, so firing a gun could bring serious results legally and potentially escalate the situation. Further, understanding how police will respond would remind a wise defender to keep the hardware holstered while exiting the back door, because suddenly bursting into a growing crowd of squad cars with a shiny pistol leading the way, might invite a hail of bullets. Regardless the situation, be it low-risk or high, tactics are king! Knowing the best way to respond, in a wide variety of situations, makes us less of a potential victim from the onset. Study and practice is required to become more capable of personal defense regardless what goes down. Another unexpected concern, and one of growing frequency, is the “Active Shooter” situation. This is an event where a single shooter, or trained cell of individuals, opens fire on a crowd in some public place. While this event is far from likely, it must be taken seriously. Homeland Security has warned the public of the intention of some factions to strike “soft targets”, like churches, malls, and restaurants. This is for the sole purpose of terrorizing the common citizenry, so the more remote and unexpected the opportunity is, the better it fits into their goal. In contrast with the other risk situations we have explored, the guns and defensive options which might be effective elsewhere pale quickly in the darkness of a theater, and across the distances associated with a shopping center. Here again, tactics are king, and escaping to safety might be the only solution. If innocent souls are dying in the chaos many “sheep dog” personalities may find it hard to flee, and would want to engage the shooter to end the violence quickly. In fact, this is the solution of law enforcement the world over. Knowing that negotiation almost never works against such animals, they have determined to introduce their own “fire teams” as quickly as possible. To identify and terminate the shooter quickly has proven to be the most effective way to save lives. With that in mind, no concealed carry savior should poke his gun around the corner to engage an Active Shooter unless he appreciates the risks of being himself misconstrued by first-responders as the threat they are seeking. 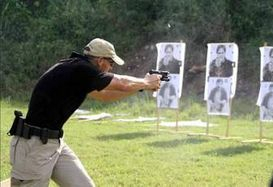 Shoot teams are trained to quickly identify a gun and to shoot its user. If, even with that in mind, one cannot endure the senseless killing, then the type of gun available at the moment makes all the more difference. Police will enter with rifles, for obvious reasons, but average citizens would doubtless have only a handgun. Accuracy with a handgun, even without the overwhelming stress of the event, will fall-off quickly beyond just 25 yards. Chances of incapacitating a potentially armored subject are thin. Hours of practice with bulls-eye targets may pay-off with a steady hand, but an errant shot may only serve to focus his attention on the defender. A circumstance like this example seems almost hopeless, but it does serve to demonstrate the extremes of the reality we face in determining our best defense. There are truly times when we must prepare ourselves to act if help may be far-off, and there are times when the best hope is to wait for that cavalry charge of professional defenders. In each circumstance, our decisions prior to an event, and during its unfolding, might just make the difference between life and death. With the realization that there are heavy decisions to make. I like to lead students to consider the holster before they decide on a gun. Weighing their risks, and eyeing their closets, I want them to think now about “how” they’ll wear a gun. A shoulder holster makes a fine way to carry a larger framed pistol when wearing a coat or suit jacket, but it would be a lousy choice under a T-shirt. Accessibility is key when choosing where to hide any gun. A holster should be comfortable of course, otherwise the gun will soon be left at home and will not be available if needed. Modern holster manufacturers offer a wide variety of options with comfort in mind. The traditional leather pouch with a loop for a belt gave way long ago to plastic paddle holsters, boasting a large waistband attachment method which allows the wearer to quickly dress for action. IWB holsters slide smoothly between the wearer and waistband, concealing the firearm with even the tail of a T-shirt. Variations will allow a user to tuck-in a dress shirt as well. If risks allow for a smaller gun, there are special holsters for pocket carry. Boxy leather cases can place the gun on a belt, where onlookers would suspect a cell phone. For the ladies, there are purses with special zippered pockets to hold a pistol. There are even and even plastic holsters which clip to the center of a bra, where, as it turns out, a small pistol is easily concealed beneath the outcropping breasts. Joggers often take advantage of a popular elastic waistband, fitted with Velcro, and having a pocket sewn into its fabric. Similar devices can be worn on ankles and calves, so that a back-up gun might be carried, or a hiker can stay armed on a hot day even if he removes his shirt. Once the decision of how to carry a gun is formed, it finally becomes time to seriously investigate a particular firearm. Knowing individual risk factors, coupled with an intended carry method, will allow a wide range of options to be slimmed significantly. This minimizes the stress, freeing the user to better focus on the handgun selection process. For people with little firearm experience, and perhaps limited time to practice, a double-action revolver might be a good handgun to start with. These are available in most calibers, and no matter how the piece will be worn, there will be a size and shape to fit the type of holster needed. Double-action revolvers are truly a point and shoot firearm, every time the trigger is pulled they go off, unless all the ammunition is spent. Most revolvers will hold only five or six cartridges, which is draw-back compared to some guns. Revolvers might feature an exposed “hammer”. Thumbing-back this hammer, old west style, will significantly improve the crispness of the trigger pull. This can allow a practiced shooter to successfully take longer shots, sometimes beyond fifty yards. If facing a particular risk with only five or six shots frightens a shooter, then a semi-automatic pistol may be a better choice than a revolver. Capacities in excess of ten to fifteen rounds are common (though some state laws limit capacity) and reloading is as easy as replacing the magazine, which can take less than three seconds. These handguns are not without their flaws though. They are substantially more complicated to operate. They can be subject to malfunctions, requiring practiced manipulation of moving parts in order to put the gun back in action. But a little training with a quality instructor and some hands-on practice will help most shooters run a semi-auto with ease. Many people feel the added capacity far out-weighs any extra learning. Semi-autos have the added distinction, above the revolvers, of having more options for trigger systems and safety devices. Some are available with the single actions hammers so loved on revolvers, offering a light, crisp trigger pull. Others provide longer, stiffer double-action triggers for safety reasons. Some have thumb-operated switches to activate a “safety”, or a button on the grip which must be depressed to fire the gun. Still others have special mechanisms on the trigger itself to render the gun impossible to fire if accidentally dropped or bumped. Sizes and shapes of semi-autos are innumerable, and finding one to suit any plan should be no problem at all. Finally, most students and shooters are surprised to find that questions about “caliber” are usually last on my list. People new to the world of guns often want to know which popular bullet is best, usually assuming that bigger is better. I like to start that discussion by stopping it. I share data from forensic studies and trauma surgeons which comes to show that “one shot” stopping power is not the product of any bullet in particular, but is always related to shot placement. Even the most timid rounds have stopped criminals, and the big bruisers have let them keep coming, all depending on where the shot hit the perpetrator. Caliber then, or bullet size, will largely be about dictating the capacity of a firearm. One magazine may hold fifteen rounds of 9mm cartridges, while a similar mag would only hold eight .45 caliber rounds. To a certain degree, of course, bullet design and power do certainly play-into the effectiveness in a defensive situation; but for the most part, these factors gain only a slight edge over an opponent. When these conversations wind-down a listener is left with a long list of questions, and my favorite parting thoughts for them have more to do with how they intend to hone their skills than with what their firearm decision will be in the end. I have come to see over the years that with enough time behind the trigger, even a bad choice of gun can be used effectively for defense. We are all constantly evolving in our life decisions, if a gun carrier starts with a less than noble choice of weapon, but gains practice and experience, they can grow to become quite capable of defensive shooting. However, if we wish to minimize the time and money spent reaching that sweet-spot of concealed-carry bliss, then get the “right” gun for the job early in the self-defense endeavor. 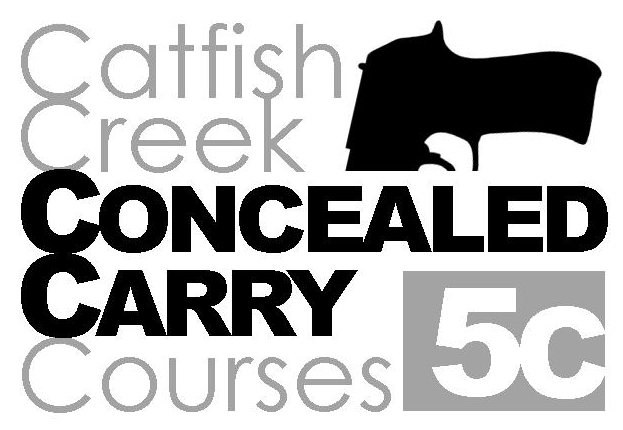 This article is presented by FiveC Handgun Training, used with permission. 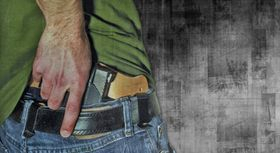 Many years in the handgun culture, and countless conversations with concealed carry supporters in and outside the classroom, have afforded the author several observations about the subject of handgun defense. Foremost among these is a frighteningly common attitude among CCW permit holders that simply having a gun when we need one is the crux of personal defense. 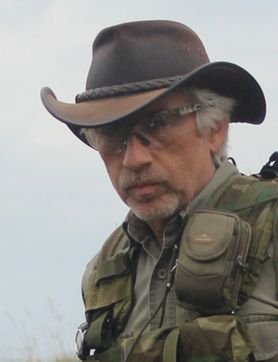 The author, FiveC's founder and chief instructor, has discovered that few people actually practice with the defensive firearms, and fewer still make any effort to continue their tactical education. In this article we explore the importance of recognizing the need to train and to be aware of appropriate tactics for various situations, and to choose the right gun for concealed carry.